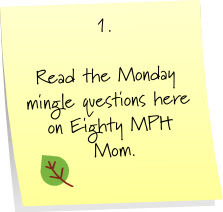 You are here: Home / Memes / Monday Mingle vlog – March 8, 2010 – Chores, Camping and Girl Scouts! We had 32 minglers last week – woo hoo! We were also graced with the presence of TWO bloggers who will be featured in the Hottest Blogger Calendar – congrats Toni and Greg! HAPPY 20TH BIRTHDAY TO MY BABY BOY! 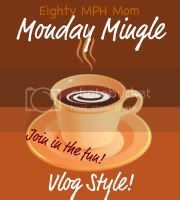 Monday Mingle vlog – March 8th from Jennifer Regan on Vimeo. 1. If you were forced to choose between skydiving, base jumping off a skyscaper, or rock climbing, which would you choose? 2. Are you an aggressive or defensive driver? 3. Due to a sour economy the genie can only grant you ONE wish. What would it be? « My Poor Dad – He Can’t Catch a Break. Or Can He? Wow girl scouts. I remember the motto, pledge, and oath. Oh my, a tornado through my capsite would be the END of my camping days. SCARY!!!!! I loved your co-mingler this week. Your daughter is a beauty like you! We should get paid for our chores, Jennifer, we should! Unloading the dishwasher is the absolute most despised job in my house. I hate it, hate it, hate it! Your hair is up, does that mean your thumb is getting alot better? That is scary about fire blowing across the camp with that tornado, but it gives you an interesting tale ja. I'd want to camp close to a river if I have to rough it. But yes my idea of camping would be a hotel 🙂 …maybe an RV. But if you live in my country in certain areas, it's almost like camping all your life! Ahh look at the pretty smiles. I was wondering if invisilign really worked. I want to try it. Anyhoo, I love the fact that both you and your daughter mingled this week! I'm not a big fan of camping either. I like my showers hot and all. lol. My mingle will be up later tonight, K? 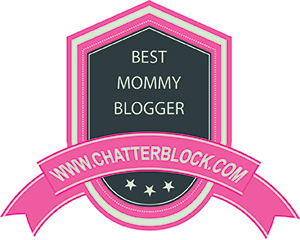 And isn't that WONDERFUL that Toni and Greg won hottest blogger? Talk to you later via the mingle! Oops I meant your son. Sheesh! I had plenty of chores, and yup, passed it onto my kids. It's a right of passage. Never went camping. Like you, my parents weren't into it. Does sleeping outside in the yard count? Did the cubbie scout thing, but dropped out when Boy Scout age rolled around. Yes we LOAD up on the cookies…its an obsession I tell you. LOTS of cookies. You two crack me up. I love you woman and totally missed commenting last week…sigh. Muwah!! I was so excited to come back and mingle for my second week that I couldn't wait till tomorrow to get it posted!! Your daughter is such a beauty, just like her momma:) I love camping and can't wait for our first trip that is scheduled for May. Hope you have a great week. Happy Birthday to your son I missed that in my video — WOW a tornado – since I am from OK, we have them almost every year — and they are always terrifying. Glad that you were able to remember some fun things even if you won't be doing it again. 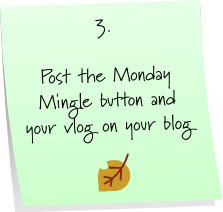 Happy Monday Mingle. 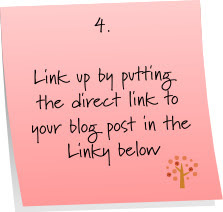 Thanks for moving my button — I am hoping that I get a few more giveaway entries on my MckLinky from that…I have been using your list to list my giveaway's for a few months – it was passed to me from another blogger and I have in turned passed the link to others. Awe, I love your mingling buddy. How perfect since she related to all of the questions. OMG, a tornado! That would be awful in a campsite, glad you weren't hurt! Camping at a resort, remember that movie Troop Beverly Hills? That came to mind. I love listening to the birds in your mingle, ahhhh…relaxing! Have a great week, Jen!! LOL about camping at a resort. I agree with Tammy, that totally made me think of Troop Beverly Hills (didn't they sell girl scout cookies in that movie too?). Okay, the tornado story . . . wow!! Scary! Your post had Hubby and I cracking up. I always love your mingles . . . have an awesome week!! I would love to have one of my kiddos participate in the Mingle but the 14 y/o is camera shy and the 8 y/o is just a complete freak. We'll see! See you next week and I'm still looking to post my "catch up" mingle next week! LOL @ Girl Scouts My dd is in 11th grade and they have the biggest scout group to graduate. There are like 40 girls in her class and 1/2 are a scout! That camping story sounds not so fun! I guess you have to be a certain kind of person to enjoy camping. I love going, but we are the party type so it's a blast for us! cute, I was going to join in but the webcam keeps crashing… maybe next week. Scary camping story. We prefer condos with jacuzzis over tents with air mattresses. I just love when SG comes to join you. Her comments and stories always crack me up. A tornado while camping? Yikes! That would scare me out of camping for a very, very long time. I love it when Speedy Girl joins you! My kids have chores too. Can't wait until they're old enough to tackle some real stuff though. Cookies!!!! Never tried the Tagalongs. Camping and tornadoes aren't a great mix. Don't blame you for not wanting to do that again. Phew! Love the Mingle, was very fun to take part. Tornados would definitely end my camping career, and Happy Birthday to your son!! You guys are TOO CUTE! Happy birthday to your son 🙂 My twin brothers turn 21 on Saturday this week, it's a crazy birthday month! I LOVED having 32 minglers I'm just sad that I can't get around to all of them lol I try to visit different ones each week though when I can so I get everyone in sometime! I think we should get paid for our chores too! I love that your daughter helps you with chores around the house! I was a brownie briefly and quit pretty soon after. I LOVE girl scout cookies especially Samoas. Boy scouts around here sell popcorn they definitely got shafted. I love Thin Mints too – did you know that Walmart has a generic brand of Thin Mints year round! I think they're $2.50. I no longer camp, there aren't enough horses that could drag me to a campsite these days LOL I would TOTALLY go RV'ing. We used to camp with group bathrooms but it was in France before they had real toilets and it was *barf*…there are no words to describe it! I can see your kids are older so they understand the value of a dollar. My family and I are weird-We would be out in that tornado like we were professional storm chasers!! Great video-Seriously love all the camping stories!! I was never a girl scout either, but I adore girl scout cookies too! My faves are frozen Thin Mints. I grew up going camping and HATED it as an adult. As I mentioned on Erin's blog, my idea of roughing it is when you have to get OUT of bed to call room service! Thank you SO much Speedy Girl for showing me your gorgeous smile. The Invisalign seemed to work beautifully. You are adorable! It was nice to see you mingle with your mom! He has the same b-day as my hubby. Gotta love those Pisces, they are great men. Hope he had a great day and all his wishes were filled!